If you want to use Google AdWords to generate leads &/or sales for your business, one of the biggest initial questions that crops up is: should you set them up and manage them yourself (self-serving) OR outsource the job to a digital agency (or web design company with AdWords skills, etc)? And my answer to you would depend entirely on your circumstances. There is NO one-size-fits-all in this scenario. So, let’s look at each option and the pros and cons. When it comes to agencies, there are a LOT of options. Every man and his dog seems to be running some sort of web design or online marketing business these days, and the quality of the service and expertise of the staff running your AdWords campaigns varies WILDLY! Some are EXCELLENT top-notch professionals who really know their job and produce great results for most clients (there is no 100% perfect PPC marketer out there – a campaign always falls between the cracks every now and then, for reasons beyond their control). These agencies are the stuff of legend inside their industry and have many years of hands-on experience. Of course, they also charge appropriately, so if your budget is tight, these kinds of agencies might be outside your budgetary capacity! From there, the flip side is USELESS “agencies” – people who are essentially scammers because they are positioning themselves as experts, when really they are crooks! Many times, these people ring your business out of the blue and promise you the world for next to nothing, “guaranteeing” amazing results or your money back, etc. I have listened to recorded phone calls from these types of people many times and the B.S. & lies they spin is shocking. Sadly, a lot of these companies operate in countries like India, Malaysia, Africa, Russia and so forth, but they have a front that appears to be a local company. I’ve heard too many sad sob stories from people who got sucked in from these scumbags and got taken to the cleaners by them to let this kind of stuff slide by. That’s one of the major reasons I even decided to write this article – to expose these crooks and charlatans for the pond scum they are! Of course, not every crook offering AdWords services is a dodgy overseas call centre! Sadly, there are more than a few operating right here in Australia (and equally, I am sure, in the USA, UK, Canada, etc.) and they’re more difficult to detect. If you’re uncertain about the capabilities of these kinds of agencies, do your due diligence with some solid google searching on them. See if there are lots of negative reviews, etc. And if they look suss, run the other way. Now, that just leaves the in-betweeners of the agency world, and they also come in many different shapes and sizes. Many are from web design companies, who now see the value of having 1 or more in-house digital specialists to sell, setup & run AdWords campaigns for their clients. Others are more tightly focussed Digital Marketing agencies who specialise in PPC, Social Media, and other forms of online marketing. Many have reasonably competent people in-house doing the work. Certainly people who are a LOT more skilled than the dodgy crooks I just mentioned. However, just be aware that 6 months, 1 year or even 3 years’ experience running AdWords campaigns does not mean they are a true expert. I can tell you, after 13 years as an AdWords consultant, that I know more about running successful AdWords campaigns now than I did a year ago, and a year ago, I knew more than I knew the year before, and what I knew after 6 months, 1 year or even 3 years of experience is not that much compared to what I know now. In other words, every year at the coal face, dealing with new, different, complex clients gives you ever-growing new skills and understandings around generating leads & sales with Google AdWords. I have seen many PPC campaigns managed by 2 and 3 year “veterans” that made me cringe, due to the poor setup or management of it. Often times, a couple of hours or a day’s work will allow me to increase results by 35% – 100% while running at the same budget or even reducing their budget. And that’s not to brag about my skills, but rather just a fact of life that the more knowledge & hands-on experience you have in this industry (just like EVERY industry in the world) allows you to see patterns and solutions far quicker, easier and more deeply than the newbies and journeymen in your line of work. Perhaps the best way to ascertain whether an agency and the staff managing your campaign are any good is to speak to their customers (as many as possible) and find out what kind of job they do and how good their customer service is and the results they have provided. Never be afraid to tell the salesperson that unless you can speak to as many of their clients as you want, you won’t sign on the dotted line. It’s YOUR money and YOUR risk, so why take chances without doing your due diligence. Now, moving on from the different kinds of agencies, there are a few other advantages to using them to run your AdWords campaigns. Time is a big one. If you’re just too busy to take on a new role as in-house PPC marketer for your business, then the only way you can get the job done is to outsource it to someone. Either pick a staff member whom you believe will enjoy the work and (hopefully) do a good job, OR go out to an agency. If you choose to run with an in-house person, PLEASE PLEASE PLEASE get them some training on using AdWords. Under no circumstances should you throw them in at the deep end and let them figure it out, or before you know it, they will have burned a $1000 hole in your credit card overnight, for little or no sales/leads to show for it! There are LOTS of great educational resources for people who want to learn AdWords. Books, online videos (including a HEAP made by Google), blogs, etc. Then there are coaches – people who have the hands-on AdWords experience and can teach and guide you &/or your staff member/s to success. When I started in the industry, I had no hands-on coach or support. My experience all came from books I purchased and studied, and hands-on experience running live campaigns for clients. I had NOBODY I could call on for help, which made it tough. In fact, it probably took me 6 months of hands-on campaign setups and management for live clients before I started to become confident at what I was doing. Can you imagine how much harder that would be for a total newbie with no training? I remember one client who had dumped the AdWords role on a staff sales person. This lovely lady had done her best, but honestly, it was a near-disaster when I took over. The first thing I did was set up conversion tracking to find out how much a lead was costing them. That came to approximately $128! So, we knew where we were at fairly quickly. A day’s work on my behalf and some tweaking of their campaign and creating some new landing pages for their website and within a week I had that cost/conversion down to roughly $8! Good for my ego at the time (I was still relatively new at that stage) but more importantly, it gave the client a big boost when they most needed it. If I had had an AdWords coach at the beginning, I would have hit my straps a LOT faster (probably 1-2 months max) AND I would have been running much more complex campaigns with ease compared to what I was doing at the time. Anyway, suffice it to say: Get some help for whomever is going to be running your campaigns if they are in-house. Another great reason for considering using an Agency is that if they’re any good, they’ve had exposure to lots of different types of AdWords campaigns, which broadens their knowledge base and makes them better PPC managers. Plus, they may also have multiple AdWords staff in-house that you can draw on for expertise. Every AdWords consultant has different fields of expertise, which allows the company to bring all of it into synergy with every client’s campaign, as needed. For example, I’ve dealt a LOT with the travel niche, small business tradespeople, dentists, solar power, financial services (loans, etc.) and so forth – so I’m very experienced in those areas. Other consultants I have met & worked with have a lot of experience with ecommerce, affiliate marketing, branding and so forth. They would typically be stronger in those areas than me. Just ensure your agency can apply ALL of their resources to bear on your AdWords campaigns, when required, and you are likely to get a good to great result. iv) You have done your due diligence and are choosing to work with a bunch of real AdWords professionals. I love working with AdWords – it definitely feeds into my highly analytical nature and the thrill I get with every win drives me onward and upwards. 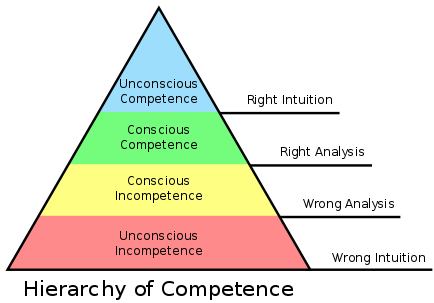 Plus when you’re at the stage of “Unconscious Competent” (thanks to Tom Hopkins for introducing me to that term) in any field, it comes fairly easily, which reduces the stress that less experience causes. HOWEVER, I also understand and accept that 90-95% of all small business owners and entrepreneurs out there will not feel this way about running their own AdWords account. Firstly, it’s extremely rare that the agency person/people will know and understand your business and your industry better than you. It’s absolutely vital that a good PPC campaign is run by someone who has made a strong effort to understand the client’s market place. Otherwise they will struggle to find ways to position your campaigns strongly against your competition. The in-house person knows their products, clients, market restrictions & advantages and competitors a LOT more than any external agency person. And it could take that agency person 6+ months to come up to speed on these things, all the while your campaign is wasting money and missing opportunities. However, you might be surprised to know how much they really cost, over and above the money that gets given to Google for your clicks. My last position was with one of Google’s largest global AdWords resellers, and I found out very quickly (much to my horror) that they mark up their clicks with approx. 50-55% margin (btw, that’s margin, not markup – that means your $1 click at Google is going to be charged to you at maybe $2+)! Given the most I was used to charging clients for an ongoing management fee was 25% markup, you can imagine how gob smacked I was to find this fact out when I came to work for them and see inside the machine (so to speak). Anyway, there are multiple larger “local” agencies around the world that follow this model, so my former employer was by no means the only one in this boat. With such a big click mark-up, what it really meant was that they were only spending a small amount of your budget on real clicks with Google (and the rest was going to sales commissions, operating expenses and so forth). This meant you were actually competing in your space with a ball and chain around your ankle! Every other player in your market who was self-serving was putting every cent of their budget into their Google campaign, buying maximum ad impressions, clicks, leads and sales whereas these agency clients only got perhaps as little as 30-50% of their total monthly invoice going to Google for their clicks. If your budget is too small, Google WILL penalise you in multiple ways, as I have mentioned on this site before. If your intention was to be a major player in your local market or at least be competitive, you’d suddenly find you were a small time player who didn’t have the steam to keep up with the big boys. It’s the lack of transparency that I most dislike in these sorts of scenarios. Firstly, the agency sales people are never told about the huge click mark ups (otherwise they’d probably all quit), and the clients never find out, and ultimately – all that’s really important – their campaigns either struggle due to a lack of real budget going to Google OR they perform well but pay twice as much as their competitors for similar results. Either way, how are you – as the business owner or decision maker – supposed to make an INFORMED choice about who will manage your AdWords? Long version short: You haven’t got a snowball’s chance in hell of making the right decision. Another one of those “transparency” issues I have with a lot of agencies (big and small) is that they set up your AdWords campaign inside one of their own in-house accounts rather than setting one up using your email address and therefore, you don’t “own” the account – they do! If you decide to leave them, they usually don’t give you access to your account, with all the work done on it over time, as well as any successes achieved. You then have to start from scratch and build a brand new account up and learn everything all over again. It will cost you a lot of wasted money AND time to do that. A lot of fun that is NOT! Regrettably, Google hasn’t sufficiently changed the rules to ban this sort of activity yet, but I live in hope that it will happen one day! No doubt you’ve heard of the famous old saying about teaching a man to fish? Well, I believe that teaching small business people how to successfully manage their own AdWords campaigns is putting the power back into their (your) hands! It allows YOU to be the master of your own destiny, and it also means you are not being held ransom by non-transparent agencies. It also means every cent you give Google actually goes to Google to help your account succeed. No wastage on agency salaries, commissions, overheads and other such rubbish. All that wasted money could not only be invested into educating and coaching the in-house person (whether that’s you or a staff member) running your campaigns, but in the long run, it would end up 100% benefiting YOUR business, not someone else’s. And truly, if you as a business person don’t have control over your marketing, you are always going to be at the mercy of some unscrupulous salesperson out there, keen to depart you from your money, for little or nothing in return. While your competitors are surging ahead due to successfully mastering AdWords, you are falling behind because you haven’t taken control of your ability to generate leads and sales online. In closing, it’s fairly obvious I am biased towards the self-serve option BUT if it doesn’t meet your needs or circumstances AND you can find a quality solid agency to run your AdWords, then go for it with my blessings. Either way, I wish you every success in your AdWords adventure, and if I can help you get there, feel free to drop me a line and I’ll see how I can best serve you.